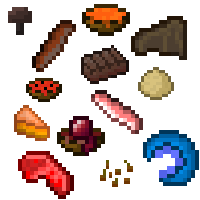 Food Expansion is a simple mod, which adds new food into the game. The mod is based around Vanilla Food and tries to enhance the Food System. Bacon can be crafted from uncooked porkchop and can be smelted in a furnace to get Crispy Bacon. Bacon and Crispy Bacon can be eaten much faster than other Food (16 ticks instead of 32 ticks). Fried Eggs can be crafted by smelting normal Eggs in a furnace. They haven't any additional effects. 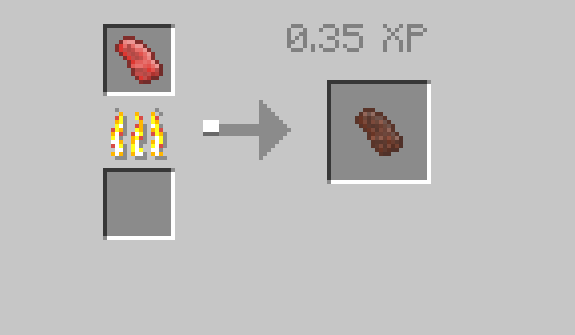 Bacon and Eggs can be crafted by combining Crispy Bacon and Fried Egg in a Crafting Table. It has no additional effects. 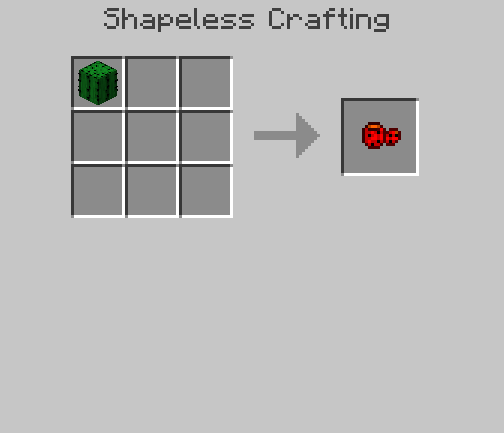 Cactus Fruits can be crafted by putting 1 cactus in a crafting Table. They haven't any additional effects. Chocolate Bars can be crafted by putting 2 Cocoa Beans together with 1 Bucket of Milk and 2 sugar. They haven't any additional effects. Compressed Flesh can be crafted by putting 4 Rotten Flesh together with 1 sugar. It has the same amount of Food Points and Saturation as normal Rotten Flesh, but it doesn't give you the Hunger effect. 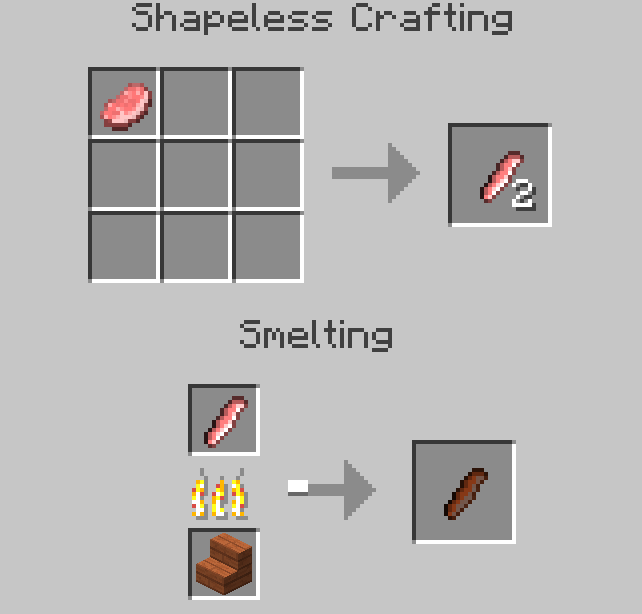 Compressed Flesh can also be smelted into Leather. 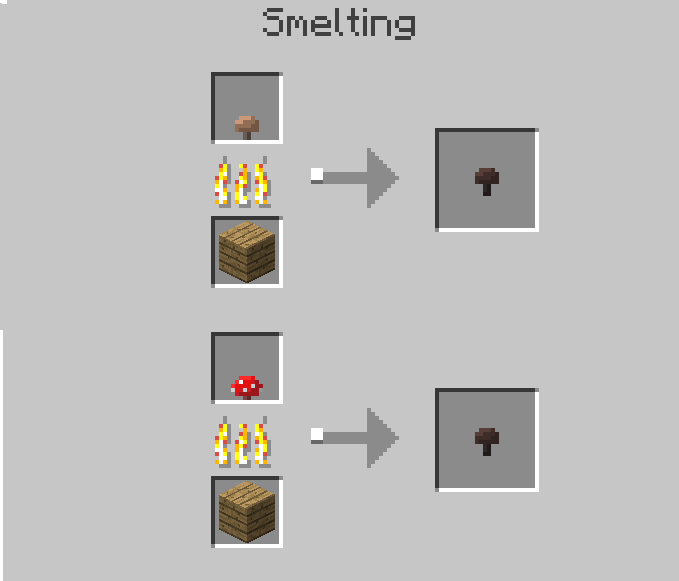 You can get a Cooked Mushroom by putting 1 Mushroom (red or brown) in a furnace. It hasn't any additional effects. 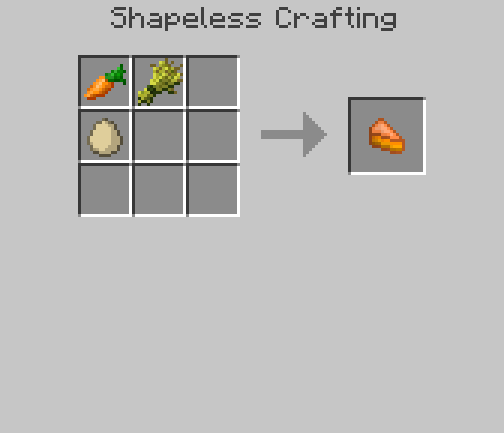 Carrot Pie can be crafted by using 1 Carrot, 1 Wheat and 1 Egg on a Crafting Table. It hasn't any additional effects. 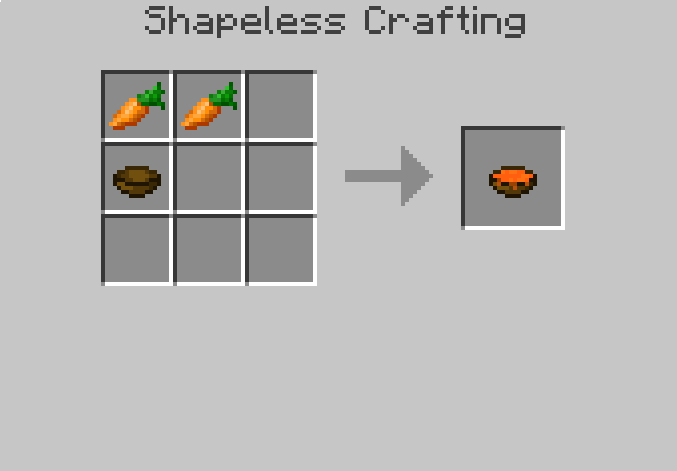 Carrot Soup can be crafted by using 2 Carrots and 1 Bowl on a Crafting Table. It hasn't any additional effects. Spider Eye Stew can be crafted by putting together 1 Bowl 1 Spider Eye and a fermented Spider Eye. If you eat this Stew, you will gain the poison effect for 4 seconds. (like the vanilla Spider Eye). But you will also get the Night Vision potion effect for 15 seconds. Blaze Cream Soup can be crafted by putting together 1 Bowl, 1 Bucket of Milk and 2 Blaze Powder. If you eat this Stew, you will gain the Fire Resistance effect for 15 seconds. Dough is the only item in this mod, which can't be eaten (Well, because dough is not yummy). But Dough can be used to get bread a bit easier. Simply place 8 wheat around 1 bucket of water and smelt the products in a furnace to receive bread. Melon Salad can be crafted by putting 3 melons with 1 bowl in a crafting table. It has no additional effects. The Roasted Seed is a easy way to get early game food. Just put some seeds (wheat, melon, beetroot (1.12+) and pumpkin are supported) in a furnace and eat those yummy seeds. Craft Lollipops with 1 Stick and 4 Sugar. It's an usefull food source if you have a ton of sugar cane. Because Lollipops are very hard you can also use them as a melee weapon. It deals 3 damage per hit. The Forbidden Fruit and the Starving Fruit are creative items and cannot be gotten by crafting. 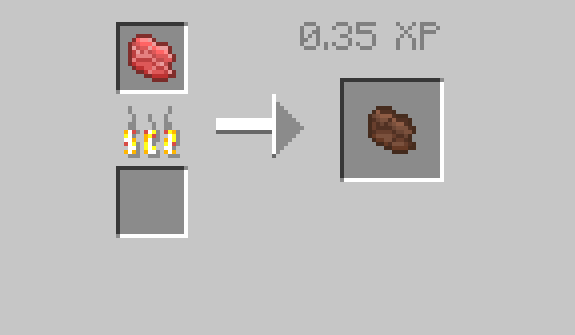 But, there is a config option to enable a Recipe (8 Notch Apples/Rotten Flesh and 1 Diamond Block) for each of them. If you rightclick with the Forbidden Fruit, your hunger bar will be instantly filled and if you rightclick with the Starving Fruit, your hunger bar will be instantly depleted. They can also be used infite times. Beetroot Noodles can be crafted with 2 Beetroots, 1 Bucket of Water, 1 Wheat and a bowl. They haven't any additional effects. The Mod also adds in 9 new Mobdrops. Mutton can be gotten by killing sheep. Sheep are dropping 1-2 Mutton on kill. Mutton can be used in a furnace to get Cooked Mutton. Both have no additional effects. Horse Meat can be gotten by killing Horses. Horses are dropping 1-3 Horse Meat on kill. Horse Meat can be used in a furnace to get Cooked Horse Meat. Both have no additional effects. Squid can be gotten by killing Squids. Squids are dropping 1-3 Squid on kill. 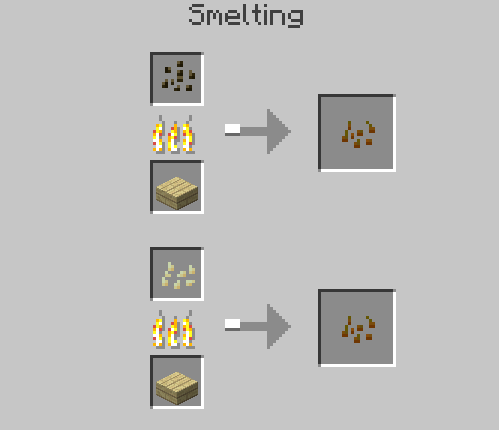 Squid can be used in a furnace to get Cooked Squid. Both have no additional effects. Bat Wings can be gotten by killing Bats. Bats are dropping always 1 Bat Wing on kill. Bat Wings can be used in a furnace to get Cooked Bat Wings. Bat Wings have a 50% Chance to give you the Hunger Potion effect for 20 seconds, if you eat them raw. The cooked variant reduces this effect chance to 10%. Wolf Meat can be gotten by killing Wolves. Wolves are dropping 1-3 Wolf Meat on kill. Wolf Meat can be used in a furnace to get Cooked Wolf Meat. Both have no additional effects. Ocelot Meat can be gotten by killing Ocelots. Ocelots are dropping 1-3 Ocelot Meat on kill. Ocelot Meat can be used in a furnace to get Cooked Ocelot Meat. Both have no additional effects. Parrot Meat is dropped by Parrots. They always drop 1 piece. Parrot Meat can be used in a furnace to get Cooked Parrot Meat. Both items have no additional effects. Llama Meat is dropped by Llamas. They drop 1-2 pieces. Llama Meat can be used in a furnace to get Llama Steak. Both items have no additional effects. Polar Bear Meat is dropped by Polar Bears. They drop 1-3 pieces. Polar Bear Meat can be used in a furnace to get Polar Bear Steak. Both items have no additional effects. You made a review but it's not on this list? Please don't hesitate. Just message me with a private message or a comment! Hey, I quite enjoy this mod for all the foods it adds and it has helped me. I added it to my modpack on my private server, however, a couple players discovered a bug with the Spidereye Stew when they eat it it does not consume the soup and gives the bowl. Great mod otherwise! 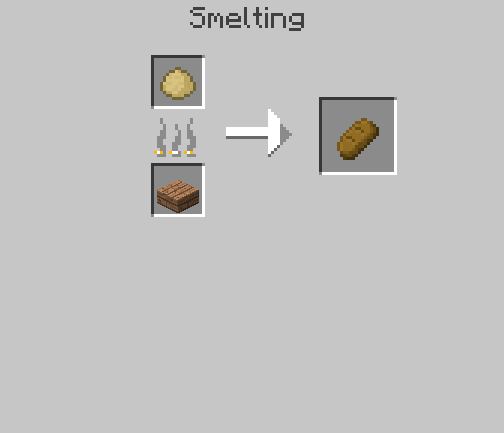 My favorite food mod, the rest are not for 1.7.10 or not simple enough. This is definitely a bug that needs to be fixed. A bottomless bowl of soup, while nice, is definitely game-breaking. I wish the mod owner was a little more active so they could fix it. There aren't any other mods out there that make bowl foods stackable. Sorry for my inactivity.. I have a lot of real life stuff going on lately. Couldn't reproduce. 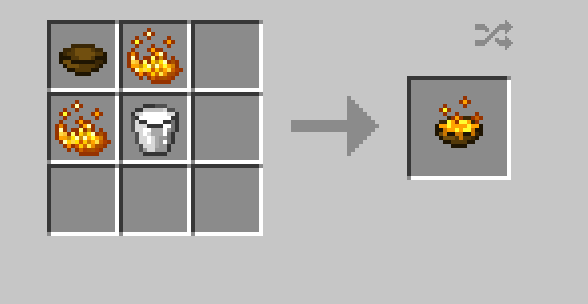 It always removes one stew and gives me an empty bowl in 1.12.2. Which mod and forge version is this? Been using the latest versions. I need to check if Quark is causing the problem, because that mod does a similar thing but only with vanilla stews. I'll get some details soon but I'm currently busy. Hello, same problem here on Forge-1.12.2-14.23.5.2796 and 1.12.2 . I've fixed it temporarily by removing the 3 vanilla items from the foodexpansion.cfg (in the stacksize section). Lamas are dropping horse meat. I'm not sure if this was the original intent or not, but I thought I would report it anyway. This is not an intent. I'll fix it in the next version. I've seen many mods that add cheese but they also do a bunch of other stuff that seems a little weird, like add a new crafting station or add like 50 different kinds of cheese and cheese blocks... All I want is a simple edible cheese item. It would probably be crafted by smelting a bucket of milk. I know it's not realistic but I think it would fit the gameplay well. Another food item that can be made from milk, perhaps it would heal less and not satiate as much as cheese. 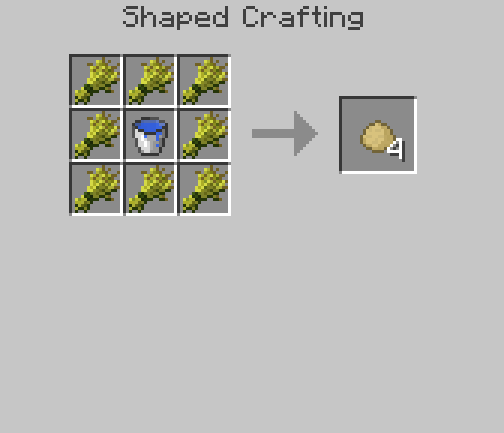 I think the crafting method should be simple, like perhaps a bucket of milk and a stick in a crafting grid. If you want to add food items that use these as ingredients then go right ahead. These would make milk a lot useful for creating food and a simple cheese and butter item would fit the game very well. Could it be possible for the cactus fruit to be made into something which restores more health? And how could I give you lang file? Of course! That would be really appreciated! Why does this mod has the "Magic" category? Because of the Forbidden Fruit / Starving Apple + I originally planed to add more magic related food. But you're right, I'll remove it.